A W9 (W-9) is an Internal Revenue Service (IRS) form that’s used to gather information about a contractor, so that their earnings can be reported at year-end. Conversely, a 1099 (1099-MISC) is the document that’s issued at year-end to show how much income the contractor earned. As a small business, collecting W-9 and filing 1099 forms can be a payroll nightmare, especially if you’re managing multiple contractors. Gusto is an all-in-one payroll and HR software that makes it easy for 1099 employees to sign contracts, fill out W-9 forms, and enroll in payroll online—no paper required. It also automatically issues and files your W-2s and 1099s and sends them to both your employees and contractors so you don’t have to. Start a free 30-day trial. Disclaimer: Tax laws change frequently. For the most up to date information please refer to the IRS.gov website or your tax accountant. 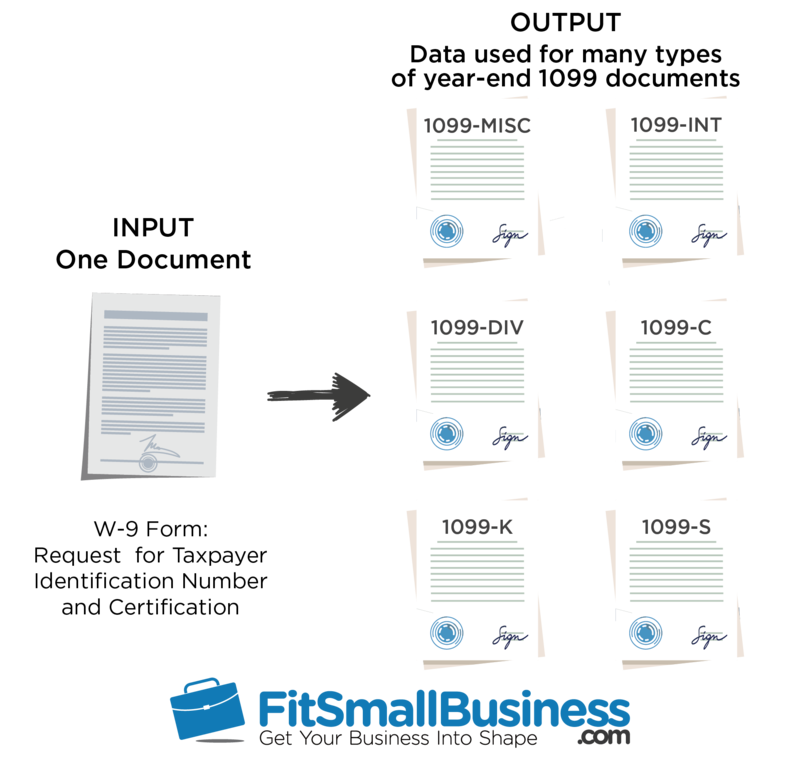 The difference between a W-9 and a 1099 is that a W-9 is an input document and a 1099 is an output document. A contractor uses a W-9 to give the employer’s payroll department the information they need to report the contractor’s earnings at year-end. The 1099 is what the contractor receives at year-end reporting their income. A W-9 is used to collect information, whereas a 1099 is used to report it. Let’s take a look at an example of how they’re used for an independent contractor doing work for your small business. A W-9 is used to collect contractor information, such as name, address, and social security number. A 1099 is used to report their income at year-end if they earned $600 or more. The IRS has many rules and caveats for when to use a W-9, as well as when to use a 1099, and what kind of 1099 to use. The illustration below shows how a W-9 is used for many different business reasons, resulting in 1099s. However, this article will focus primarily on using it for a contractor, resulting in a 1099-MISC being issued at year-end. We’ll look at the 1099-MISC in more detail later in the article. The best time to gather contractor data on a W-9 is when you first begin working with the contractor. That way, if they earn over $600 in the tax year, you’ll already have the information needed to complete the year-end 1099. We also advise you consider when a W-2 should be used instead of a 1099-MISC, such as when you hire employees or workers who don’t meet the requirements of a 1099 contractor. The W-9 form, Request for Taxpayer Identification Number and Certification, is an IRS document used to gather data your business needs to report to the IRS at year-end. However, since IRS forms change, your best option is to use the IRS website as your primary source for any IRS tax forms or instructions. You’ll find detailed directions there to help your contractors complete the form correctly. Once your contractor completes the W-9, keep a copy of it on file in case you’re ever audited. The completed and signed W-9 demonstrates that you gathered the correct data for the taxpayer. The IRS does not need a copy of this document. You can download the W-9 document and instructions in English or Spanish from the IRS website using the links below, or go directly to IRS.gov and search for ‘W-9’. 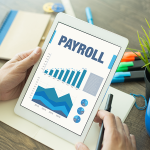 In addition, if you use payroll software like Gusto, W-9 and other tax documents are provided and often available for e-signature and online storage, helping you maintain a paperless payroll system. While most of the data fields are self-explanatory, with instructions and resources on the IRS website, a common question is what a TIN is. The TIN is the taxpayer identification number. For an independent contractor who doesn’t have a business entity, it’s their social security number. Business owners and contractors will use their federal employer ID number as their TIN. If the contractor doesn’t provide a TIN, the IRS requires you to withhold 28% federal tax, which will then be reported on the 1099-MISC at year end. The 1099-MISC is an IRS document that’s used to report all kinds income, such as that received by an independent contractor for work provided to a business or private employer. It’s like an employee’s year-end W-2 with similar data fields, but used by businesses that pay non-employee contractors such as freelancers or contract workers. Use a 1099-MISC to reports payments made to a contractor who earns $600 or more in a tax year. Of course, there are other reasons a person might receive a 1099-MISC, like for crop insurance, fishing boat proceeds, or golden parachute payments. But for a typical contractor, those boxes will remain blank on the report. 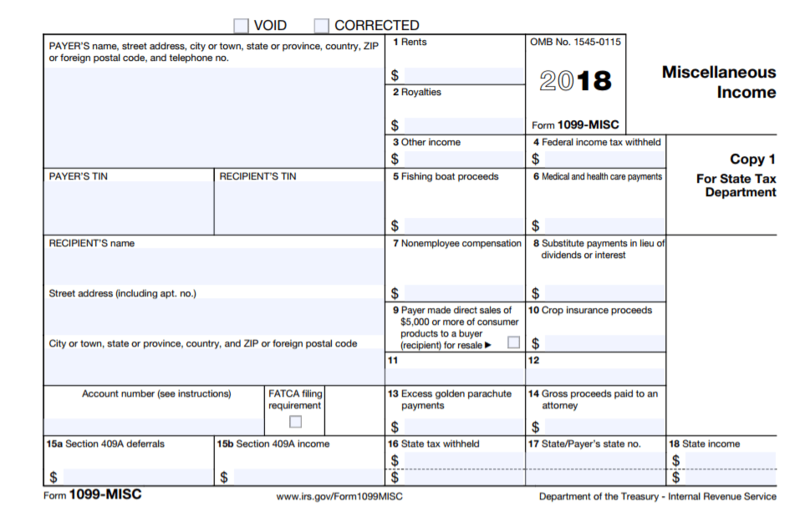 Like the W-9, the 1099-MISC, as well as instructions to use it and a definition of every field are available to view or download by searching for 1099 on the IRS website. You can download the 1099 document and instructions from the IRS website, using the links below, or go directly to IRS.gov website and search for ‘1099-MISC’. The 1099-MISC is not yet available in Spanish. For a 1099-MISC, you’ll add your information under “Payer’s Name” and the contractor’s information under “Recipients’ Name”. Then you’ll show how much you paid on “Gross Income”, box #3, “other income”. You’re not likely to have taken out federal or state income taxes, so leave those boxes blank. Check out our complete article on the IRS 1099 form reporting or download the 1099-MISC instructions for more details. You’ll issue a 1099-MISC form at year-end for any contractor who has earned $600 or more during the tax year. A copy of the 1099 is sent to the contractor as well as to the IRS. Just like an employee’s W-2, the 1099-MISC is to be sent by January 31 following the tax year end. Although the 1099 is used for reporting payments to independent contractors, if the contractor is a non-resident alien or foreign business entity, an IRS Form 1042-S is used instead. This form accounts for unique tax withholding rates and foreign treaties. The IRS provides a webinar to explain when to use a 1042-S.
Because W-9s are used to gather information for all kinds of future 1099 payments, we’ve included a few of the common 1099s below. Each 1099 is linked to the IRS web page where the downloadable documents and instructions for using them can be found. While IRS rules are pretty clear, there are little mistakes that may require you to re-issue a 1099. For example, make sure your 1099 form includes the full name of the contractor. Double check the spelling, TIN number and the payment amount. (You don’t want the contractor to have to pay taxes on $6,000.00 when they only earned $600.00). Issuing 1099s to employees. Employees should receive W-2s instead. Issuing 1099s to corporations. You don’t need to. Only independent contractors that work for you need 1099s. If you hire a corporate business to do a service, like clean your office each week, no 1099 is needed. 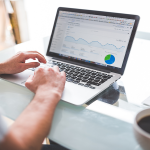 The relationship between a W-9 and 1099 is that the W-9 gathers the data that’s later reported to the IRS on a 1099-MISC for contractors that you pay $600 or more in a tax year. A copy of the W-9 is kept in your business files, while copies of the 1099-MISC are provided to the IRS and to your contractor. The contractor then uses the 1099 to report their income when filing their taxes. Remember to sign up for a free 30-day trial of Gusto, which lets contractors sign W-9 forms online and automatically files your 1099s and sends them to your contractors. Gusto also makes it easy to manage payroll taxes, make direct deposit payments, and helps you stay compliant with all federal and state employment laws. Click here to get started. My previous employee is paying out punitive damages to me indicating they should be reported on a 1099 as they are not taxable. Please advise if any special codes should be listed when filling out the W9. It’s not uncommon for employers to confuse 1099 vs W-2 workers’ status. The form itself (which is only 1/2 a page) requires 6 pages of instructions from the IRS. However, there’s really no special codes you need to use if you’re just a contractor working for an employer. Just don’t forget to give your employer your complete mailing address, including zip code on the form. Also include your SSN (unless you have a business with an EIN). Here is a page online where you can find out more. 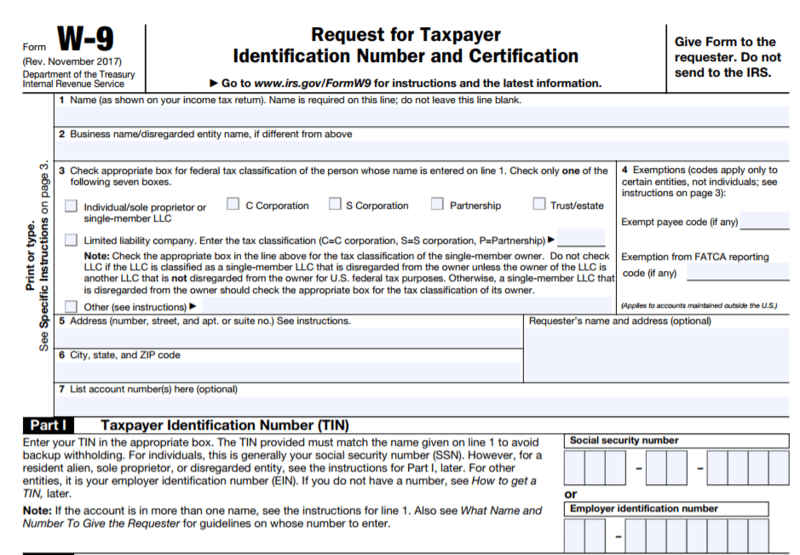 https://www.irs.gov/forms-pubs/about-form-w9. Of course, if you have tax-related questions about the form, you’ll need to talk to a tax advisor. Fit Small Business can’t provide tax advice.